The other day my 11-year-old son told me, “Poor people are poor because they don’t try hard enough.” I hope that he said this just to provoke me into debate (like mother like son). But the truth is, I think that empathy is something that he – like many people – struggles with. Intellectual smarts, which he has plenty of, are an entirely different aptitude than being able to imagine oneself in someone else’s shoes. We had a long conversation about how hard it is to move out of poverty, and all of the barriers to success posed by a lack of access to good schools, health care, friends and relatives with interesting jobs and good connections, and all of the other advantages my son has. But discussions are not enough. Empathy is an ongoing, difficult struggle in ourselves and in our culture. Despite this speech, fostering empathy is not a visible priority in either the school curriculum or whatever remnants of civic dialogue are present in the United States. In fact, empathy is poorly defined, poorly understood, and rarely taught. What is the role that museums can and should play in addressing this gap? 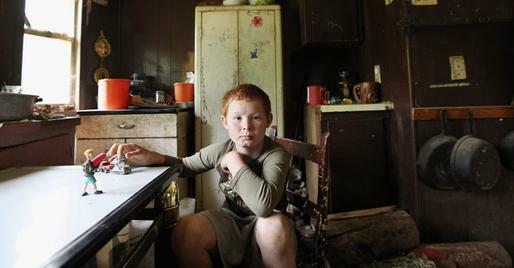 A child in Owsley County, Kentucky, median household, which has one of the lowest medium incomes in the United States. Empathy is a feeling of shared emotion with another person. It is not “I understand what you are feeling,” but rather, “I am feeling what you are feeling.” Empathy is often the result of what history educators call “Perspective taking.” Perspective taking is imagining or hypothesizing about what it would be like to be in another person’s shoes. Because they are so entwined, the phrase perspective taking is often used interchangeably with empathy. What do museums have to do with empathy? Gretchen Jennings writes that museums have a responsibility to demonstrate empathy toward their communities. In doing so, they might not only serve their visitors better, but also model a kinder society. On another level, museums may be particularly effective vehicles at engaging visitors in empathetic responses. Museums provide immersive, personal experiences. Looking at a portrait of someone, or visiting an exhibition about a historical figure or moment, these distant people are palpable and present. The greatest benefit we owe to the artist, whether painter, poet or novelist, is the extension of our sympathies. Appeals founded on generalizations and statistics require a sympathy ready-made, a moral sentiment already in activity; but a picture of human life such as a great artist can give, surprises even the trivial and the selfish into that attention to what is apart from themselves, which may be called the raw material of moral sentiment…. when Hornung paints a group of chimney-sweepers, — more is done towards linking the higher classes with the lower, towards obliterating the vulgarity of exclusiveness, than by hundreds of sermons and philosophical dissertations. Art is the nearest thing to life; it is a mode of amplifying experience and extending our contact with our fellow-men beyond the bounds of our personal lot. Last year, working as a consultant, I was fortunate enough to do some work with the Lower East Side Tenement Museum in New York City. My job was to uncover the types of connections visitors were making, and to help the museum understand what educator techniques and behaviors fostered these impacts. Although we weren’t looking at empathy specifically, we kept circling back there. Of all of the types of connections made, empathy – which for this study we defined quite loosely as “exhibiting a response that indicated that visitors understood what someone else might have been thinking or feeling” – was the most common. Visitors were twice as likely to exhibit or claim empathetic responses (either on the tour or in focus groups after the tour) than connections with their own family story. They were four times as likely to exhibit empathetic responses as they were to make connections between these historical families and contemporary social issues. An earlier study at the Tenement Museum also emphasized the prevalence of empathetic feeling as a visitor outcome: In a 2013 study researcher Laurajean Smith found that 22.5% of visitors reported feeling empathy with immigrants of the past after the tour. 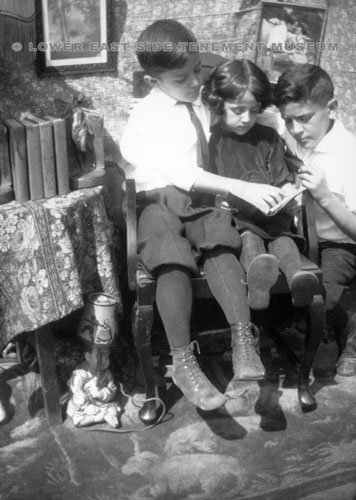 Three children from the Confino family, one of the families that lived at 97 Orchard Street, now the Tenement Museum. There are some techniques that history educators recommend for fostering empathy. Some of these are better rooted in research than others. But it appears likely that empathy – like other museum outcomes – is something that we can do a better job of fostering if we know what works, and why. Empathy requires hard work. People often imagine how others feel or felt based on their own personal experience or on stereotypes. If you are going to make empathy a goal of your programs or tours, make sure to provide time and support for this. Provide context before asking people to imagine the lives or feelings of the historical figures visitors are studying. Make sure this context is relevant, and will help visitors answer or consider empathy-related prompts. If you are teaching about people who lived in the past, make sure not to compare the past and present in a way that suggests people suffered because they don’t have what we have now. No one in the 19th century felt like they were suffering because they did not have computers, television, or air conditioning, so it is not useful to suggest this to visitors. If you are talking about people who are physically uncomfortable, consider making your visitors (mildly) physically uncomfortable. Research shows that when people are physically comfortable, it is harder to empathize with people in states of discomfort. Converse, B.A., Lin, S., Keysar, B., and Epley, N. (2008) In the mood to get over yourself: Mood affects theory-of-mind use. Emotion, vol. 8 no. 5, 725-730. Cunningham, D. L. (2009). An empirical framework for understanding how teachers conceptualize and cultivate historical empathy in students. Journal of Curriculum Studies, v. 41 n. 5, 679-709. Epley, N. (2008). Solving the (Real) Other Minds Problem. Social and Personality Psychology Compass, v. 2 n. 3, pp 1455-1474. Galinsky, A. D., Ku, G., & Wang, C. S. (2005). Perspective-Taking and Self-Other Overlap: Fostering Social Bonds and Facilitating Social Coordination. Group Processes & Intergroup Relations, v. 8 n. 2, 109-124. Lee, P. & Ashby, R. (2001). Empathy, perspective taking, and rational understanding. In O.L. Davis Jr, Elizabeth Anne Yeager, and Stuart J. Foster (Eds. ), Historical Empathy and Perspective Taking in the Social Studies (pp. 21-50). (New York: Rowan and Littlefield Publishers, Inc.
Riley, K. L. (2001). The Holocaust and historical empathy: The politics of understanding. In O.L. Davis Jr, Elizabeth Anne Yeager, and Stuart J. Foster (Eds. ), Historical Empathy and Perspective Taking in the Social Studies (pp. 139-166). (New York: Rowan and Littlefield Publishers, Inc.
VanSledright, B. (2001). From empathic regard to self-understanding: Im/Positionality, empathy, and historical contextualization. In O.L. Davis Jr, Elizabeth Anne Yeager, and Stuart J. Foster (Eds. ), Historical Empathy and Perspective Taking in the Social Studies (pp. 51-68). (New York: Rowan and Littlefield Publishers, Inc. If you will be at AAM, come hear more at the session “Exploring Empathy: Research on a Hot (but Tricky) Concept,” which I am co-presenting with Adam Nilsen and Miriam Bader. March 30, 2015 in Museum Administration. ← What is “Classroom Management” in the museum? I recently took an Audience Research class at the University of Washington. In small groups, we created an evaluation plan for an exhibit of our choosing in Seattle. My group chose, Imaging the Arctic at the Nordic Heritage Museum. The potential for visitors to feel empathy for people of the arctic was there. As a group we struggled with how to measure empathy. I’m curious about the rubric you used to measure empathy Rebecca, and if you think it is a universal enough design to share. I didn’t have a rubric that empathy in any detail. I was looking much more generally at connection-making and the types of connections visitors made, so empathy was just one of eight types of connection-making I was looking for. So we identified types of behavior or comments that might evidence empathy (which, again, we defined very broadly) and looked for those types of behaviors. Pingback: How Can Museums Foster Empathy? I am Ex. Dir of an historic house museum Mitchell Young Anderson Museum in Thomasville GA and it was a house owned by an African American family for 127 years. I would like to install an Empathy museum program in the house for people to experience going from being an enslaved person to becoming 1st generation African American middle class. This would be an excellent way for people to experience what it was like to have been white people in this town who like black people went from the Civil War to being lucky to live in a town in which wealthy white people came from the north with money developed the town into their winter resort and all of these people went from being dirt poor to being well off and some rich. What must have that day to day living have been like? How do I get such a program? The Tenement Museum would be an excellent resource as you think about developing such a program. I also want to recommend the novel Homegoing, by Yaa Gyasi – https://www.amazon.com/Homegoing-Yaa-Gyasi/dp/1101971061 – on this topic.